nothing makes me happier than breezy, low-60s crisp fall weather. currently living in my go-to fall classics: trusty A.P.C. 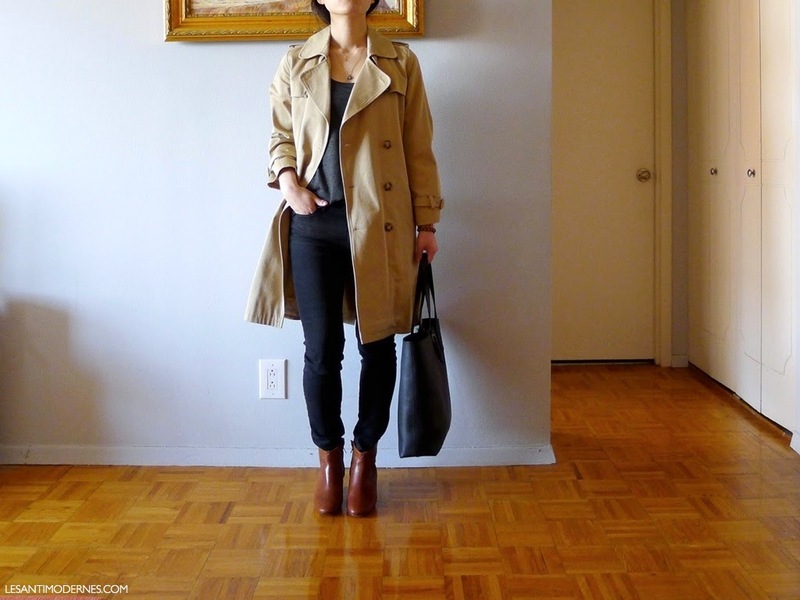 trench (similar here and here), ryan tank, black rag & bone jeans, dicker boots, and petra tote. do you have a classic fall favorite? trench weather is the best! Looove. I'm looking for a new trench--currently mine is by BCBG, and it's lovely but not exactly warm! I'm thinking something with a removable lining so I can wear it through the seasons! Oh, I couldn't agree more on the Ryan tank. It wasn't until I thought I'd lost it a couple months ago that I realized just how critical it is to my wardrobe (turns out it was just "lost" in the black hole that is my underwear drawer). As always, wonderful outfit! I like wearing corduroy and velvet blazers in fall colors, like rust or damson. It looks so good in the (warmer) fall lighting and with my red hair. I would wear a trench if I could find a color that looked good on me. It is also great to be able to pull out my grey and black cashmere sweaters again! Fall is definitely my favorite style season. yes to grey and black cashmere - i'm looking forward to bringing out mine! I see myself getting a lot of use out of my H&M leggings and new RIck Owens dress...appropriate for all my casual occasions. I have a similar APC trench(bit longer with a wool collar, in black) that I just can't get into. It cost me dearly so I'm reticent to sell it... anyone have experience taking up a trench like this? Don't want to wreck it! My fall go-to pieces are always my Barbour Bedale jacket in olive and caramel APC camarguaise boots. Effortless and waterproof! We've got a super late fall happening down here; alas none of my faves have had a chance to shine! My last two falls had me donning a uniform that was anything with a leather vest + persian lambhair collar on top. Love the classic pieces, but I have to ask, are you really just wearing a tank top under your trench?! I feel like I have to go through phases, tank with cardigan, then long sleeve tops, then long sleeve tops with cardigans, then sweaters, then trench coat... The idea of wearing a jacket or coat over a summery top just sort of made my brain explode. I break out my old Gap olive green utility jacket, my Steve Madden suede booties and my Paige Jimmy Jimmy's. Oh, and my favorite Saint James navy/white striped Mariniere top!